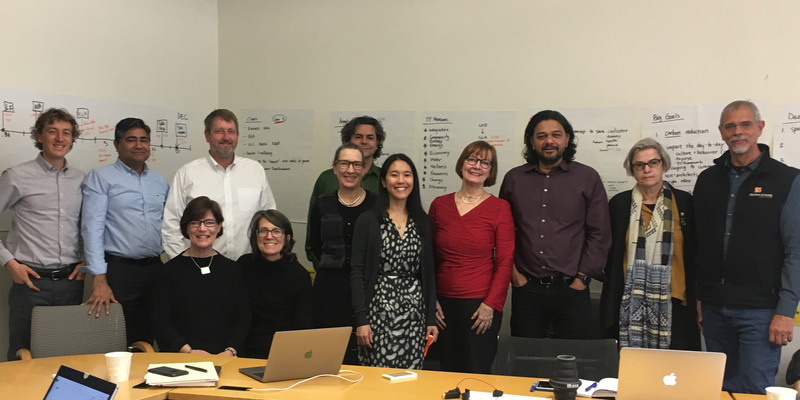 Marsha Maytum started 2019 as the new Chair of the AIA Committee on the Environment (COTE), a Knowledge Community within the American Institute of Architects (AIA) dedicated to advancing sustainable design, building science, environmental issues and policy. In February she traveled to Washington, DC to participate in Congressional meetings with House and Senate leaders to discuss the Green New Deal, the proposed national infrastructure bill, and a new tax depreciation plan to incentivize investment in building energy efficient projects. 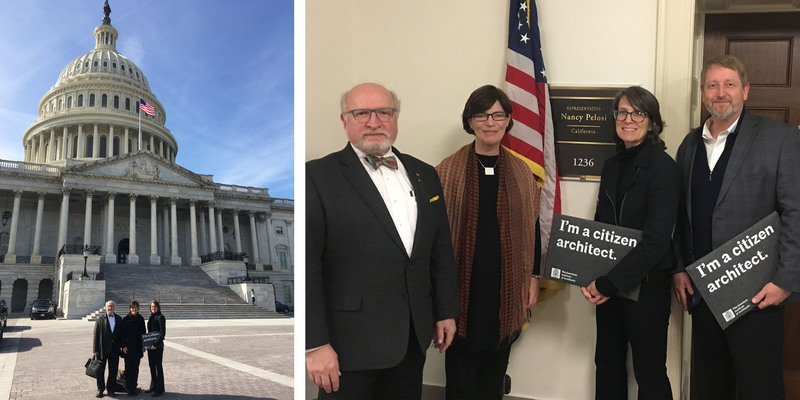 Annually, members of the AIA participate in advocacy outreach meetings with members of Congress address key issues impacting the profession of architecture. During Marsha’s 2019 visit to the Capitol, she and the COTE Advisory Group (AG) shared their expertise as architects addressing climate change through the design of high-performance buildings. In her March newsletter addressed to the members of the AIA, Marsha stated, "Members of the COTE AG took charge and met with members in both the Senate and the House, Democrats and Republicans to take action on climate change and to invest in sustainable, energy efficient and resilient buildings as part of the national infrastructure bill." Her team met with staff from the offices of Speaker of the House Representative Pelosi (D-CA); Senate Minority Leader Senator Schumer (D-NY); Majority Committee staff from Senate Energy and Natural Resources Chaired by Senator Lisa Murkowski (R-AK); Representative Sean Casten (D-IL), who serves on the new House Select Committee on the Climate Crisis; Chair of the Senate Energy and Natural Resources Committee Senator Cory Gardner (R-CO); Senator Grassley (R-IA); and Senate sponsor of the Green New Deal, Senator Edward Markey (D-MA). The group discussed the importance of the building sector in addressing climate change and requested their support in tax incentive programs for energy efficiency in both existing and new commercial and residential buildings. The COTE AG also discussed the Green New Deal with Senator Markey, one of the sponsors of the stimulus program. The Green New Deal is focused on addressing climate change by cutting carbon emissions across the economy. COTE members advised him on the important role architecture and the building industry have in climate action, referencing architectural case studies across the United States that are pushing forward on a zero-carbon future. Michael Davis, FAIA, a member of the COTE AG stated, "These meetings were great opportunities for AIA COTE to share our legislative priorities and offer our support and expertise to House and Senate leadership on a number of issues including building energy efficiency, planning for resilience, and design excellence. We were encouraged by the degree to which House leadership has prioritization climate change, and also by the belief expressed by both parties and in both branches of Congress that improving the energy efficiency of the nation’s buildings was important work." Additional items COTE will be tackling in 2019 include the advancement of the new AIA COTE Top Ten Toolkit as a resource for firms and practitioners during their design process. The committee will be hosting live webinars on how to use this valuable resource. On April 22, COTE will honor the 49th anniversary of Earth Day by announcing the 2019 winners of the COTE Top Ten Green Buildings in the country and the COTE Top Ten Student Competition.